Rhythm games are my Jam, pun totally intended. I was all in on Guitar Hero when it came out. I preordered the Rock Band bundle for Xbox 360 when it first came out. I even bought an electronic drum kit so I could play Rock Band 4 pro drums. So when I saw Double Kick Heroes come across my desk for review I was ecstatic. But does Double Kick Heroes live up to my expectations or crash and burn on the highway to hell? Double Kick Heroes is a unique spin on the rhythm game genre. You are a band, driving down the abandoned highway in a post-apocalyptic America. Their ride is outfitted with weapons to ward off the zombies and bandits you run into. It also serves as a de facto stage as they perform. While the car will barrel down the highway, a 2nd track will race across the bottom of the screen like a sideways Guitar Hero track. The game starts with a simple enough mechanic. You use the W and S to move bands jerry-rigged roadster up and down on the screen and you use the arrow keys to smash notes. The keys that control the drums fire your weapons and control and shift shoot bombs. But be careful not to rock to hard, as smashing the skins too much will overheat your guns and downgrade your streak. The higher the streak the better the weapons. All in all Double Kick Heroes is super easy to pick up and play, but hard to master. It has a great hook for any abandoned by the industry lover of rhythm games. Double Kick Heroes is beautiful. It uses a retro pixel art aesthetic, which isn’t exactly unique. Although it feels refreshing, the animation and colors just fit perfectly. During songs, while you race down the highway, everything looks great. The scenes of dialogue, all text-based sadly, have each character occupying one side of the screen and you really get to see the detail and awesome character design. Each of the main characters has a genre of metal style about their character’s design. The scenes of action are awesome to watch as you jam away speeding down the highway, but it takes away from the beauty because you’ll have to stay focused on the notes. The whole time I spent jamming away I had a smile on my face because the art was just so glorious. I’m not just if it was just the splashes of color across the barren landscape or what but during songs the game really shines. 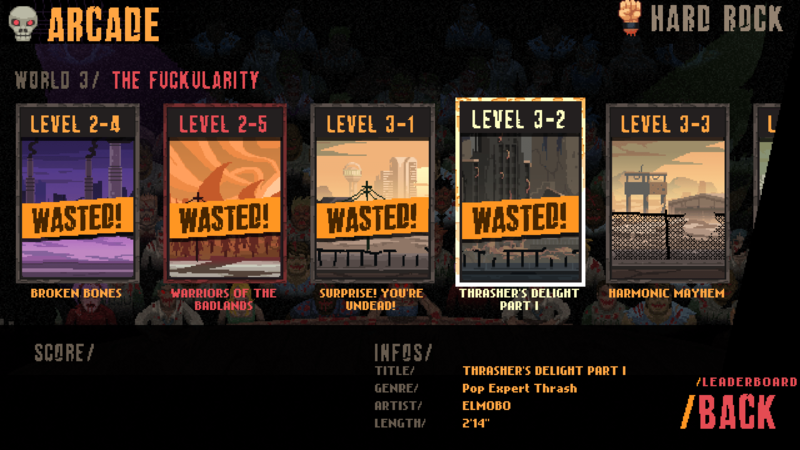 Double Kick Heroes’ story is it’s the weakest feature. The game starts with the band about to perform a show but “ughto” zombie apocalypse. It’s generic and played out. The writing is sub-par, with cringe-worthy jokes sprinkled throughout. After the first few cutscenes, I started to just skip them because they were more annoying than anything. Maybe it’s just ignorance, as I’m not a big metal fan, but most of the jokes just fell flat. And running into characters based on real like rockstars with names like Marlene Branson…made me roll my eyes. The story mode can keep you entertained for hours. If that isn’t enough then like most classic rhythm games there is an arcade mode. Here you can hone your skills on songs at your leisure or repeatedly rock out to your favorite jams. The gameplay hook is fun enough to keep players entertained and coming back for more over and over again. Double Kick Heroes is super fun. It has its downside but doesn’t take away from the awesome gameplay and beautiful art. Rhythm game fans can find a new home in Double Kick Heroes, and one hell of a good time.